The society was formed in 1971 by our current secretary David Pettitt. Meetings were held originally at Morton Youth and Community Centre in Carlisle. The picture shows an early exhibition put on by the society. 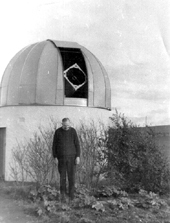 In 1977 the society was offered a 16 inch diameter telescope mirror by its maker Harry Clough of Ayr, who had since built a larger 24 inch mirror for his own Newtonian reflector (see right). At that time one of our members, David Ramshaw, was Head of Physics and Electronics at Trinity School, a local 11 - 18 school with over 1700 pupils. He also ran an astronomical society at the school for the pupils. Having previously taught for several years at Carlisle Technical College, which is on land adjacent to Trinity School (now Carlisle College), he also knew many of the staff at the college. It was decided to approach the Local Education Authority, the School Governors and the Technical College with a view to initiating a project to provide the City of Carlisle with an observatory and telescope, which would be open to all. To cut a long story short the outcome was that the observatory (shown at the top of this page), housing a 16 inch Newtonian reflector, was built on the school premises over a period of about 10 years. The Border Astronomical Society members designed the observatory and telescope, Cumbria education authority paid for the mirror, the school governors paid for the materials and the telescope and observatory were constructed free of charge by Technical College students as part of their training programme. The whole project cost less than £7000 over the ten year period. The observatory was opened by Heather Couper, astronomer and broadcaster, in 1988. Heather was president of the British Astronomical Association at that time. Since then the society members have operated the observatory and developed the facility on behalf of the school governors. Funding has come from member donations, occasional donations from the school governors and, more recently, a lottery "Awards for All" grant. As a result during the summer of 2002 the telescope and observatory underwent extensive improvements. New gearboxes and drives have been constructed for the telescope, which will soon be computer controlled. A "Starlight Express" CCD one shot colour camera, complete with computer and monitors has been installed on the telescope. It is now possible for people downstairs in the observatory to observe on a large monitor what the telescope is photographing upstairs. A security camera also monitors the action in the observatory. With the new disabled access ramp which has been fitted to the observatory anyone, whatever their age or disability, can participate in the viewing session. Since then we have further updated the telescope with a new electronic drive donated by David Pettitt. In addition to our normal timetable we have participated in many national events such as National Astronomy Week, National Science and Engineering Week and BBC Stargazing Live events. We have also participated in all 13 Starfests arranged by Scarborough and Ryedale Astronomical Society in Dalby Forest, near Pickering.